Free shipping rudraksha beads string (mala) 5 mukhi (five faced), size: 8mm, weight of a string (mala) is approx 29.38 grams. 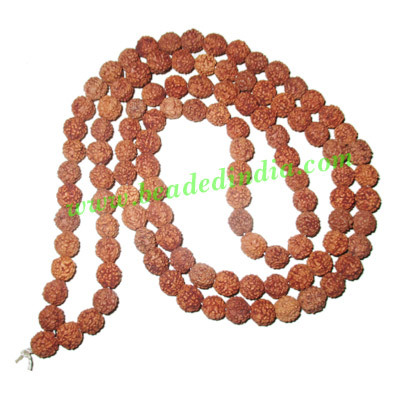 One string (mala) has 108+1 rudraksha beads, used for chanting mantras for spiritual attainments as well as multiple health benefits by wearing it or keeping at worship-meditation place. Sterling Silver .925 Fancy Beads, size: 17x14x6.5mm, weight: 2.92 grams. Silver Plated Fancy Beads, size: 14.5x9.5mm, weight: 3.62 grams. Silver Plated Headpin, size: 1.5 inch (38 mm), head size : 6x7mm, weight: 0.42 grams.